Driving small cars isn’t a turnoff to me. I enjoy their economy, their simplicity their easy handling and their low cost. But frugal needn’t mean blah, and Ford’s Fiesta has learned that lesson. It offers a spunky look and feel, good handling and an overall simplicity that helps you enjoy the pure driving ability of the car. And it does it without all the electronic gee-whiz gadgets that add so much cost to today’s cars, yet it was no fuddy-duddy. I drove the SE hatchback, the mid-level model of seven trims. There is the base S sedan starting at a bargain basement $14,000, all the way up to a racy ST hatchback with a turbocharged four-banger at $21,400. 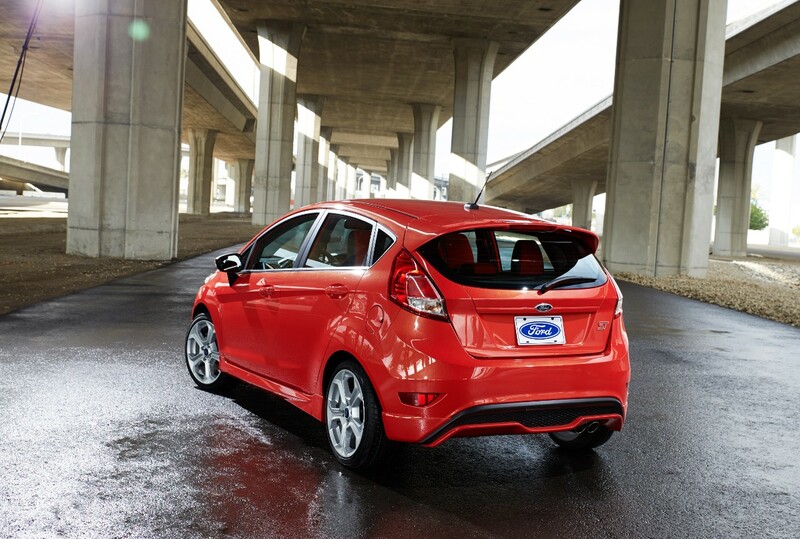 The Race Red SE hatch is indicative of what many Fiesta buyers will select and lists at $16,050. First, the hatch gives you more cargo hauling capability and it looks sportier in profile than the sedan. There’s even a little spoiler in back. 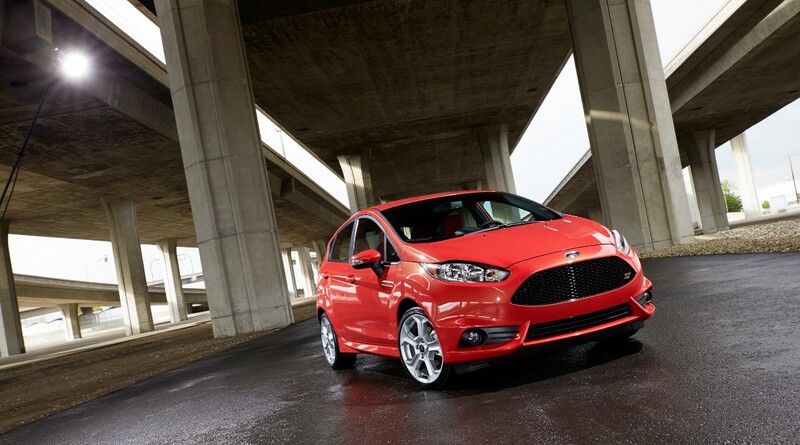 Standard to all but the ST model is a 1.6-liter, Duratec I4 that creates 120 horsepower that is effectively put to use via an easy shifting 5-speed manual gearbox. The Fiesta never seems slow or pokey. While no speed racer it’ll get up to highway speeds easily and feels downright frisky as you pull away from stoplights, having good low-end torque. That’s quite a contrast to the Nissan Versa Note I tested recently. It felt way underpowered, yet these cars are almost identical in price, amenities and weight and the Note was just 11 horsepower shy of the Fiesta. At 2,537 lbs. the Fiesta is only about 60 lbs. heavier than the Nissan. Yet it feels more agile, with more responsive, fairly quick steering. This is a fun car to drive and easy to maneuver into tight parking spots. Steering effort is light and breezy. Ride is decent too, much more refined feeling than the Versa Note, despite riding on a 4-inch shorter, 98-inch, wheelbase. Longer wheelbase usually translates to smoother ride. This uses MacPherson struts up front and a twist-beam rear suspension. Braking comes from discs up front and drums in back, thus keeping the cost down. To get four-wheel discs you’ve got to go to the pricier ST version. Stability control is standard. 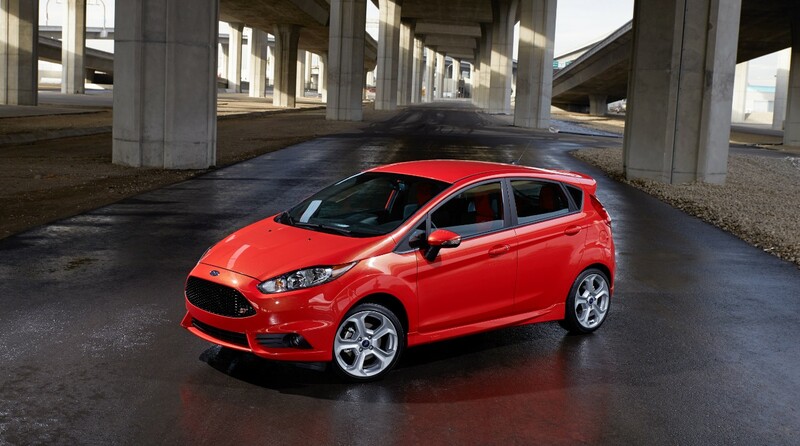 The base Fiesta rides on 15-inch tires while the SE with its appearance package ($995) boosts that to 16-inchers and adds painted aluminum wheels. Nothing wrong with a little spiff in the looks department along with slightly larger rubber. Inside, the red test car featured a black textured dash and cloth seats with gray trim and red stitching to deliver a youthful, sporty look. This is well beyond the utilitarian look you’d expect in a low cost car. The dash even has a black gloss trim with a sort of winged center stack. There’s pewter-look trim on the steering wheel hub and around the outward air vents and door release handles. Fiesta’s interior is attractive and efficient. The seats were comfortable, yet firm for durability. Front seats are manually adjusted and well contoured, especially the seat backs. I appreciate the pump handle on the seat’s side to boost it for shorter drivers, plus this had one-speed (super hot) front seat heat, part of the comfort package option. Ford also puts a manual tilt/telescope steering wheel in Fiesta. The Note’s wheel only tilted. In back, the seats split and fold down to boost cargo room, but they do not fold completely flat. The sedan has 12.8 cubic feet of space and the hatch will have more, but Ford did not have an official number available. Fiesta’s dash is fairly simple yet stylish with bright light blue gauge needles and that winged center stack that includes a touch screen radio and navigation system. Navigation costs $795 extra, so a bit overpriced compared with portable GPS systems. I had some concerns though with the radio, which sounds fine, but features absolutely miniscule channel selection buttons on the screen that are nearly impossible to use while driving. First, take off your gloves in winter and then you’ll need to use the tip of your pinkie finger to touch just one of these micro-buttons. Good news, the tune and seek buttons (not part of the touch screen) are large. A little further down the attractive center stack are the climate controls, which include two big knobs for the fan and temperature settings, but it’s a little tight to get at those and the round heat directional dial as all are directly behind the gear shift knob. Overhead the visors are solid, but do not slide or extend. Visibility is excellent though, usually a benefit with a hatch, plus there’s a rear wiper that helps clear the window of frost and snow, a winter benefit over any sedan. I also like that Ford has created a self-sealing fuel filler. So when you pop open the fuel filler door there is no gas cap to remove or replace, another plus on cold wintery mornings when you need gas. Naturally you won’t be needing gas too often. All Fiesta models are rated 27 mpg city and 38 mpg highway and drink regular unleaded. I got 32.4 mpg in a week’s drive, about 60% city driving. The red test car, once its various options, and a $795 delivery charge was tacked on, ended up at $18,925. That’s modest in today’s market and in line with the Nissan tested two weeks back. About the only thing I’d add to this is a back-up camera, which the Nissan had. Folks looking for good looks, good handling and good power at an economy price will certainly find much to like in the fun little Fiesta. Hits: Good acceleration and handling with decent ride. Useful hatch design, modest price and super hot heated seats, plus tilt/telescope steering wheel. Misses: Tiny radio touch screen buttons, tight to get at climate controls behind shifter, rear seats fold down but not flat.